Your handbag (or purses, or bag, or tote, or whatever you have) goes with you just about everywhere! While your outfit changes daily most of us don't switch handbags daily--so a new one is always nice. I am curious, how many purses do YOU have? Do you have one "everyday" one and a "special" one? How about the moms out there? Does your purse double as a diaper bag? I know that mine often does! 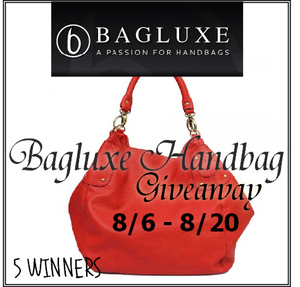 READY TO WIN ONE OF THOSE FASHIONABLE BAGS? They have so many great bags, but a couple of my favorites are the Dematria Embellished Flap Satchel Grey and the Brooke Tote Bag. It's announced on the form above!